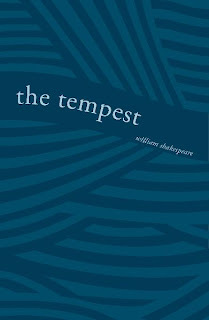 On August 16, I posted my thoughts on the first two acts of William Shakespeare's The Tempest. You can find them here. I will sadly say that I set the play aside for a bit as I went on a reading craze and when it came time to go back to it, I had to reread what I had finished to refresh my memory. Thankfully the play was easy to fly through and I finished the entire play the other night. As the first Shakespeare play that I was reading by myself (all the others I have read for this project were rereads of plays I had read in high school and college), I was surprised at how easy it was for me to decipher things. Perhaps it was because of my previous experiences with Shakespeare as a writer, or I am just getting better at understanding more complicated language, but I did not struggle too badly. With all of that being said, I absolutely adored the play and it is probably one of my favorites (behind Much Ado about Nothing and Macbeth). The character of Ariel, in particular, I developed quite a fondness for, and I was loving the amount of action and intrigue in the play. While I sit lazy by,'" (III.i.22-28). I love this exchange. It is full of the courtesy and chivalry that should be evident in the beginning stages of love, don't you think? But Ariel...what an interesting character. Trapped until Prospero freed him, he is not a servant to Prospero and spends most of the play doing his bidding. I could feel the unfairness of Ariel's situation. Prospero and Miranda are abandoned on the island and while Prospero has power, there is nothing he can do to free them. Ariel is finally free and probably believed that a man had finally come to free him, but rather than be granted the freedom that Prospero also desires, he is no better than a slave. It is an interesting contradiction and I was happy when Ariel was freed at the end. Overall, it was a play I rather enjoyed. It was a little darker than his comedies, and certainly wasn't a tragedy. It was a play that I could imagine was received in awe, given the effects needed to carry out Prospero's magic. It is definitely a play I would love to see live and learn more about. If you participated, leave your thoughts, or a link to your site so I can come and visit! Weekly Wrap-up for August 29, 2010: One Year Down! I kicked off my celebrations of one year blogging on Wednesday. August 25, 2009 was when I started this whole crazy mess and began developing this project. I feel I should point out that while the 25th is when my blog began, I didn't start book 1, The Odyssey by Homer, until September 1 (I started it immediately after reading Catching Fire on its release date). It has been a crazy year with a lot of ups and downs. And while I feel like my professional life hasn't changed much (still no job), I think that I making great strides in realizing what I ultimately want to do. I can thank the authors I have read this year, and their work, for inspiring me in ways that I'll never forget. Writing has always been therapeutic and something I could rely on, and this blog has become a reflection of that passion. I can tell that my writing has improved over the course of the year. My exposure to new works and authors have influenced how I see things, and while I wish I didn't leave in so many typos (I am not an excellent "typer." I never learned the proper way to type), there is some improvement in my style. In this past year I have really committed myself to writing. I've finished a few short stories and have two outlines for novels. One is in the process of being written. The other is going to sit on the backburner for a bit longer. Whether or not they ever get published...well...we'll see what happens if I pursue that route. Anyway, there will be a few more reflective posts coming up, but the main ones were posted last week. I hope that if you missed them you'll go back and take a peek. I had a super-productive reading week. It reminded me of the old days, before this project, when I read a lot more YA and fantasy. Last Sunday I read The Hunger Games and on Monday I flew through Catching Fire. I actually finished it earlier in the day than I thought I would, so I had to go get a magazine to tide me over. Tuesday morning found me waiting outside my bookstore to go get a copy of Mockingjay. I finished it by Tuesday afternoon and then couldn't decide what else to read. I eventually grabbed Amy Tan's The Joy Luck Club off the shelf and read 8 pages before calling it a night. Matt went out Wednesday night so I snuggled into bed with the cats to read a bit before going to be bed early. I ended up getting sucked in and read the rest of the book until 1:30 in the morning. Thursday found me in the same conundrum as Tuesday night, so I reached for The Catcher in the Rye and flew through that in one day. Friday was spent trying to finish The Tempest and I succeeded. And Saturday night I read a little of Charlotte Bronte's Villette before going to bed early. Yeah, I spent almost every spare moment either blogging or reading this week, and I loved every moment of it. I still have my assigned Bleak House reading to do for Wednesday's post, and I think I might knock that out tonight so I can get back to Villette, which I am rather enjoying. I've also been craving a reread of Sophocles' Antigone, so I may read that in the nest few days. I hope you are all enjoying your week and you get lots of wonderful/joyous reading done. Dreiser is definitely a mouthy sort of fellow. I mean, he likes to take his sweet time saying what he needs to say, and kind of rambles in a long and complicated way, repeating the same idea that he mentioned in the last chapter. But it works for him, I guess, since I'm still reading and I finished the second of three parts in this massive tome. At 370 pages long, the second part is more than double the length of the first part, and only slightly more exciting. At the end of the first part, Clyde escapes Kansas City after an accident of sorts. We find him at the beginning of the second part working in a hotel in Chicago. By chance, he runs into his wealthy uncle (his father's brother). Clyde impresses his uncle and manages to land a job in his uncle's factory. Clyde believes this to be his saving grace and his way to finally move upwards in society. He moves and begins work. His uncle and family seem to ignore Clyde-mostly likely because they are embarrassed by Clyde's humble status and his family. However, Clyde works hard and is eventually promoted to working in a room where he supervises a group of young girls. His one rule is not to get involved with any of the women in his room. I'll give you one guess what he does. Roberta is a beautiful girl from a very poor family. She is living with a friend in town and seems slightly naive. Clyde and her begin an affair. While she is loving and willing to commit to Clyde, he is more fickle. At first, everything seems fine. He falls in love with Roberta and she with him. They see each other in secret so that no one will catch them and report him to his boss. He even convinces her to get a new place to stay so he can go to her room at night (scandal!). Then, he is scooped up by society. A group of young men and women who are in the elite in town realize who he is related to and start taking him around. Clyde goes to dinners and parties and gradually leaves Roberta behind. He falls for another girl and rather than being honest with Roberta about his feelings...he just lies to her. It all comes to a head when she realizes she is pregnant. This is where the novel really began to grab hold of me. On one hand, you have a young, innocent girl who didn't ask to be knocked up, and knew better. Clyde pressured her and promised her marriage. She wants him to help her and cannot understand why he won't. Clyde, on the other hand, has always wanted money and society standing. This is his opportunity to make something of himself and become more than his parents. He fell out of love with Roberta, which happens, and doesn't know what to do. If he marries Roberta, everything he has worked for will disappear. If he continues to ignore her, then she'll take action. It is certainly a sticky situation and it was hard to decide where to lay my empathy. I mean, Roberta is a sweet girl, who knew better and let a man's "needs" take over. But I do feel for Clyde and now I understand why Dreiser took his time developing who Clyde was and where he came from. You, as a reader, have to sympathize with him a bit, since he is struggling, and trying. But, at the same time, Clyde is infuriating. You want to shake him, or at least smack some sense in him for making such stupid mistakes. Then, the book takes this dark and twisted turn into the crime and Clyde's decision to "take care of" the problem by murdering Roberta (again, not a spoiler-it says it on the back cover). You have to wonder about the desperation that must have taken hold of Clyde when he made that decision. The last 30 pages of this section flew by to that inevitable climax when Clyde throws away his life...as well as Roberta's. The third section looks like it is going to focus on the aftermath, and I am sure that once I finish it I will have more to say about the drama of Clyde Griffiths. I only hope it moves along faster than the first two parts. Someone really needed to edit this monster before publication. 100 pages of courting Roberta was not necessary to establish their relationship, you know? Anyway, I thought it would be fun to give you a recount of what I have read this past year and give you some fun and different links to each of the titles I finished. They will go month by month, so if you are a recent follower, perhaps some of my early titles will interest you! I began with The Odyssey and had an uncomfortable moment when I finished it. Next up was Crime and Punishment and I was grateful to get one of the most intimidating books on the list out of the way. I was actually surprised how easy it was to read! I also had a funny run-in at the library. Next up was E.M. Forster's A Room With A View, which my readers voted for. I fell in love with one character in particular. The last book in that first month was Pride and Prejudice, which my sister picked out for me to read next. I found some great author criticisms to make me laugh. October began with some Shakespeare as I re-read Much Ado About Nothing and I fell back in love with Shakespeare's beautiful gift with words. I decided to then get in the Halloween spirit and read Mary Shelley's Frankenstein, which I had somehow never read before. I then felt it was time to bond with Tolkien and revisit old memories, remember the Ents, and come to the end of all things with Frodo and Sam. Hemingway's classic The Old Man and the Sea found me remembering fishing with my grandfather with its beautiful language and story. November started with the creepy story McTeague by Frank Norris and I was left feeling somewhat disturbed by its dark and morbid tale. I then bit the bullet and matched off with my arch-nemesis Great Expectations by Charles Dickens. He made me fall asleep, procrastinate, and then turn one of his characters into a sandwich. I was then moved by Toni Morrison's beautifully written The Bluest Eye. Last, I turned to Albert Camus' The Stranger and was left feeling uninspired. December was an emotional month as my wedding day was fast approaching. I was also absorbed in Emile Zola's Germinal for the greater part of the month. When I finally finished it, I felt like I was somehow much older and wiser. The second book I squeezed in before the holidays was Richard Adam's Watership Down, which made think of bunnies in new ways. The new year dawned and I attacked with a vengeance. I read Travels with Charley in Search of America by John Steinbeck as Matt and I traveled half the country to and from our honeymoon. The mood and tone of the novel reminded me how much I love the country I live in. I returned to an old and trusted friend in Edith Wharton's Ethan Frome which only confirmed my mad love affair with Edith. Next was D.H. Lawrences' Sons and Lovers and it left me feeling hardly anything. That all changed as I read the heart-breaking The Dollmaker by Harriette Arnow and stayed awake for a week thinking about my own life. The cold month of January ended with my second foray into Shakespeare with The Winter's Tale. I rediscovered my love for Tom and Huck in Mark Twain's The Adventures of Tom Sawyer and scared Matt by telling him I want a boy just like Tom. I then felt sorry for poor Catherine Sloper in Henry Jame's Washington Square. The Mill on the Floss by George Eliot reminded me why she is one of my all-time favorites with the tragic elegance of the story and her writing style. Book 23 was the always entertaining and scary Animal Farm by George Orwell which made me contemplate that tricky area of politics. I was then upset by the lack of emotion I felt with Annie Proulx's The Shipping News, which I had high hopes for. I turned to Willa Cather's O Pioneers! next, as a way of conquering an old demon...and I ended up loving her style. The month ended with a long-time favorite, Little Women by Louisa May Alcott. The third month of 2010 was a great success, with more novels read in those 31 days than in any other month. It began with "the green light" and F. Scott Fitzgerald's The Great Gatsby. I then tackled a complete unknown in one of the Bronte sisters (Emily) and her Wuthering Heights. Even thought I hated everyone, I still loved the book. Alias Grace by Margaret Atwood reminded me I need to read more of her work. Golding made me feel creepy with his Lord of the Flies and I determined it just wasn't for me. Miller and his Death of a Salesman left me contemplating the American Dream. After finishing Moliere's The Misanthrope, I felt like I should have participated in drama in school! I rounded out my time with plays with Anton Chekov's last play, The Cherry Orchard and left it feeling like I just didn't get it. I began my journey with Holmes and Watson in A Study in Scarlet and The Sign of Four before turning to another old favorite in Virginia Woolf's lyrically beautiful Mrs. Dalloway. The month ended with the thought-provoking The Picture of Dorian Gray by Oscar Wilde, with the hope I could one day teach it to students. I began the month with another Shakespeare play, Macbeth, and remembered my fondness for the witches. Vonnegut reminded me why he is so wonderful and weird with Slaughterhouse-Five. I continued with Sherlock and Dr. Watson in The Adventures of Sherlock Holmes and read Jack London's The Call of the Wild in one sitting for the read-a-thon. I read the one unknown Austen novel left on my shelf, Persuasion, and realized that I am growing up. This was also the first month I participated in a read-along and I flew through my second Dostoevsky with The Brothers Karamazov. May began with a monster when I completed Alexandre Dumas' The Count of Monte Cristo for the Classics Circuit past the date I was assigned (oops!). Once again I was swept into 221B Baker St. with Holmes and Watson in The Memoirs of Sherlock Holmes where Doyle finally killed off Holmes (for now). I explored my first dive into Thomas Hardy with The Mayor of Casterbridge and explained my fondness for wonderfully written characters. I decided to get a high school classic out of the way with Of Mice and Men by John Steinbeck and again, felt hardly anything when I finished it. Book 44 was another old friend, As I Lay Dying by William Faulkner, with its famous one sentence chapter and the emotions it evoked when I set it down. I took another adventure with my Baker Street buddies in The Return of Sherlock Holmes and discovered how Holmes was "resurrected." Lastly, I took a big risk by reading a novel surrounded with controversy, but I ended up falling in love with Margaret Mitchell's Gone With the Wind. June started with another trip with Watson and Holmes as they solved the case of The Hound of the Baskervilles. Pumped up, I read The Prime of Miss Jean Brodie by Muriel Spark and left feeling like once more, I was missing the point. I then went to a deserted island with Robinson Crusoe by Daniel Defoe and was surprised to find that I liked the island narrative. Who knew? Once more I contributed to the Classics Circuit by reading Ivan Turgenev's Fathers and Sons which has sparked within me an interest to read more Russian literature. During this packed month I hosted not one, but TWO read-alongs. Gulliver's Travels by Jonathan Swift was a reread for me, but offered a lot to discuss. I also read Cranford by Elizabeth Gaskell with a great group of people! 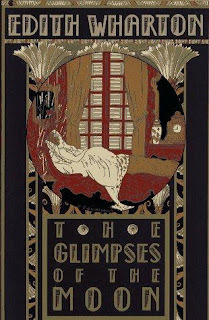 This month began with some time with an old friend, The Glimpses of the Moon by Edith Wharton and found that life experience changed my reading experience. I traveled to the United States and back in my Sherlock Holmes novel, The Valley of Fear. In the middle of the month, I traveled on vacation and enjoyed some fun reads that were not from my list. But I also managed to host another readalong, this time over Gabriel Garcia Marquez's masterpiece One Hundred Years of Solitude. One year later has brought me to August, where I am still checking off titles on my list of 250. 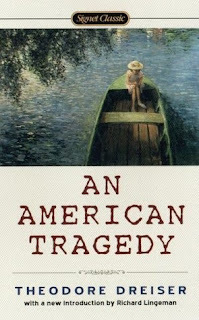 This month I completed the monstrous An American Tragedy by Theodore Dreiser, which I had been lugging around with me since early July. A friend at work convinced me to finally read James Fenimore Cooper's The Last of the Mohicans and I may be throwing my dislike for Cooper out the window. I also took my last two trips with Watson and Holmes in His Last Bow and The Case-Book of Sherlock Holmes. With all of the hype, I also managed to fit in The Hunger Games, Catching Fire, and Mockingjay by Suzanne Collins as books I really wanted to read. After reading Collins' work, I was worried nothing would catch my attention, but I reread Amy Tan's The Joy Luck Club in one sitting. The Catcher in the Rye by J.D. Salinger is my next novel and I am looking forward to revisiting a novel that I loved the first 2 times I read it. I am also hosting another readalong for William Shakespeare's The Tempest, as well as meandering (torturing myself is more like it) my way through Bleak House by arch-nemesis Charles Dickens. 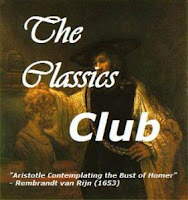 I am looking forward to another year of great classics! Happy Reading everyone! In celebration of completing one year of my personal challenge, I am looking back at the things I have achieved in that time. A couple months into reading solely classics, I was getting a little bothered by only discussing the books I was reading. I was very new at blogging, and to be perfectly frank, knew nothing about the large "book blogger" community I was finding myself in. Memes were something completely foreign to me, but I decided to have a somewhat weekly feature on my blog called "Thursday Treats." The goal of this feature has always been to highlight some of the books I have read in the past and loved. I have tried to offer a mix of the things that I have discovered over the years, and while I have only managed to feature 25 books/series so far, writing my weekly Thursday Treat post is one of the highlights of my week. I like seeing reader reactions to some of my favorite books, as well as the inevitable memories these titles evoke. For me, writing about my favorite books of the past is a great way of discovering myself as a reader, and as a person. The books I have read in the past have brought me to this point, so reflecting back offers a lot of opportunity to remember where I was when I held that book in my hands. I find that selecting the title for each post to be therapeutic. These titles are a part of who I am and what I bring to each of the classics I am now attempting to read. "We thank you for your childhood." 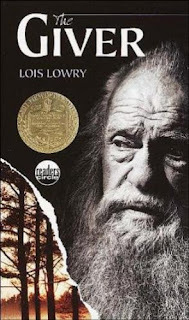 As a child and teenager, I don't think there was another book that I read more than The Giver by Lois Lowry. From my first reading of it in the fifth grade, The Giver has remained one of my all-time favorite novels, if not my SOLE favorite. Lowry's novel about a future with no color, music, feeling, history, or choice had a deep and lasting impact on me as a child. I could not imagine not being able to see the colors around me when the leaves changed in fall, hear the music that moves me so, or remember the stories of our past. It was a book the frightened me, as I worried that we as a society would someday forget to pass on the lessons of the past. It is a beautiful and heart-breaking book that is sometimes dismissed because of its "Young Adult" status (THAT is a whole other rant). I have always clung to it, since I find in Jonas a courage I don't know that I would have myself. The Giver was the beginning of dystopia and all of the modern dystopian novels can pay it homage for what it accomplished. Jonas turns 12 and his role in his community will be assigned to him in a formal ceremony. As his friends learn their future roles, he is passed over. When it is finally his turn, he learns that he will become the next Receiver of Memory, the only person in the community who feels and remembers what came before. If you haven't had a chance to read this, you need to go and get a copy. It is a book that has helped define who I am as a person and what I believe. I don't think I can remember a book that I have read with a stronger message. Exactly one year ago I sat down at my computer in frustration. It was the end of August, and I realized that yet again I was facing the knowledge of knowing that I had failed, once more, in getting a teaching job. I had interviewed all over the area, and had some great moments speaking with principals and schools, but for some reason no one would hire me. I was angry and upset. And mostly frustrated. I didn't know what I should have done differently, or if I could have done anything to make myself stand out. One year ago I sat down and decided that I would do something for myself. If a school did not find me worthy of being on its staff, I would educate myself as best I could so that one day, I could say "Look at what you turned down." It was that day that I decided to embark on this odyssey of mine-to read the books of the great authors and learn from them. I figured, that if they could teach me something, perhaps one day I could teach my students. That has been my mantra for the past year, and through all of my experiences with books off this list. To be perfectly honest, I am surprised to still be here, still reading off this list of 250 classics and writing about it. Too often have I given up on my goals and plans, but here I am. That has to say something about what these books have done for me. They have taught me great things and I am still learning. I know I have a long way to go...there are still many titles left on my list, and a lot of things to look forward to. I still may not have a teaching job, but you know, perhaps I am not meant to be a teacher. I have come to realize that what I think I want, and what I need, are two entirely different things. And that is perfectly okay. This week will be a celebration and reflection of this past year of blogging. Today, I want to point you to that first post I wrote one year ago-the post where I opened up and said what I was trying to accomplish. If you missed it, go take a look. It might help explain why I am doing this, and why I can't give up. A couple of weeks ago I took a look at the 200ish titles left on my list and realized that if I want to keep my sanity when I get near the end, I needed to read another Charles Dickens novel. I ended up writing a post (Help Me Torture Myself) to get some advice about what horrible Dickens novel to read next. The comments were amusing, and as it turned out, Amanda over at The Zen Leaf had already decided to host a readalong over Bleak House lasting into October. It was like the heavens open and a light shining down. Dickens would be much better to handle in a group (I think). So, I signed up and procrastinated a bit before starting the book. The thing is, I am convinced that my hatred of Dickens is somewhat ill-founded. Truth be told, I thought the only Dickens I have read from cover to cover is Great Expectations and that was twice-once in high school and once last fall. And I truly hated it both times. I also was "Assigned" to read Hard Times in college and it is the only assigned reading I never finished. I think i let my earlier prejudice get in the way. But now that I think about it, I have read A Christmas Carol, and liked it...so...well, perhaps I will like more Dickens. I decided that going into Bleak House, I would simply pretend his name was not on the cover. Alas...I think that my overwhelming prejudice is going to torment me some more. I finished the first 85 pages (7 chapters), which was my assigned reading for the week. And while it wasn't the total hell I equated with Great Expectations I still wanted to yank Dickens from his grave and yell, "GET TO THE POINT!!!!" The fact is, he rambles. About nothing. He uses far too many adjectives and it bothers me. I get that he is trying to weave and intricate tale, but he does not need 85 pages to say what was said in the first 7 chapters. Here is my condensed version. Esther is a poor girl who grows up unloved. When she is orphaned, a rich, unnamed benefactor sends her to a school so she can learn to be a governess. There, she befriends all of the girls and is much loved by everyone. Finally, she receives a letter from her benefactor saying that her skills are needed. She leaves for London and meets Ada and Richard. It will be her task to be Ada's companion. They go and spend the night at a crazy lady's house who cares little for her children. While there, Esther takes care of all of the children and they all love her to pieces. Also, Ada, Esther and Richard for a walk in London. They meet a crazy lady who insists on taking them back to her place. They go and learn about the courts and something about "Jarndyce and Jarndyce" and that it may have an effect on them. While with crazy old lady, they meet a crazy man and his cat. It is awkward and uncomfortable. When they leave London, they go to the house of their benefactor, and everyone is much pleased with one another. Esther is loved to pieces because she is so nice and caring. There is also some rambling that has nothing to do with the narrative and which makes no sense. Okay, I know I am probably not being fair, but does he have to go on and on all the time? Perhaps it is too early to fit the random pieces in with the narrative, but I am finding that there are too many threads to hold in my head at once. I want more explained to me....in simple English. I think I may need to go back and skim to see if I can fit it together...or just read the next few chapters and let it sink in. The fact is, I am frustrated because I think I am hindering myself from enjoying the novel. I have this prejudice and it is hard to fight. Anyway, I think I best leave my tirade against Dickens here for this week. I WILL be back next week and hopefully I will have pleasant things to say, and that some pieces of the puzzle will be placed together. 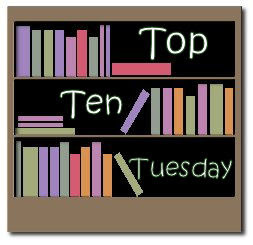 Top Ten Tuesday is held every week over at The Broke and the Bookish. It is a meme that simply requires the blogger to create a list in response to the topic. Personally, I love lists. I make lists for everything. It drives my husband crazy because he finds them everywhere. And it annoys him that I even put a little space to put a check mark by my to-do lists. Anyway, this week's subject is to list the top ten books we haven't read. I felt this was a great topic-especially since I had this discussion yesterday with my co-worker! Most of the titles listed below are from my list, but there might be a few surprises! 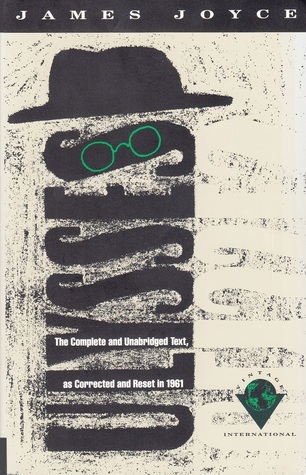 Ulysses by James Joyce. I discussed this at work yesterday, but Joyce absolutely intimidates me. I'm not sure why since I have no experience with him, but the idea of this monstrosity frightens me. Jane Eyre by Charlotte Bronte. Until this past winter, I had never read anything by any of the Brontes. For some reason, none of their work appealed to me. And I have heard many great things about Charlotte, but I still have little interest in her masterpiece. Les Miserables by Victor Hugo. This is another one of those titles that intimidates me, but for no real reason. I just feel like it is going to be way over my head, or overly complex...or something! Anna Karenina by Leo Tolstoy. While I feel like I have conquered Dostoevsky and his work, the other Russian mastermind scares the living daylights out of me. While I have heard this is a little more accessible than my number 5 choice, it still hasn't left my shelf. War and Peace by Leo Tolstoy. This book is a monster. And I feel like the only way I am going to get through it is with a support group. I may tackle this during the winter months, but we'll see how THAT goes. Othello by William Shakespeare. Usually when I talk about Shakespeare, people mention this play as one of their favorites. I have never had the opportunity to read it, but at least I now own a copy! Journey to the Center of the Earth by Jules Verne. Considering how much I love science-fiction, this one always comes as a surprise to people when I mention I haven't read it yet. Verne seems to encompass a lot of things I love about literature, so hopefully I fix this soon. The Girl with the Dragon Tattoo by Steig Larsson. I bought this way back when it first hit the shelves....mainly because the title and cover attracted my eye. It seems as if everyone who reads this, loves it, but I just haven't had time to get around to it. Perhaps when I am done with my challenge I'll finally pull this from the shelf. The Percy Jackson series by Rick Riordan. I bought the first three a few years ago at a book sale and they sat next to my bed for months. Considering how much I really do love YA, these books seems to be right up my alley. I just haven't gotten to them yet! Brave New World by Aldous Huxley. I think I began to read this book back in college, but got carried away with classes and never returned to it. Again, as a lover of science-fiction, that surprises me! Luckily it is on my list and will soon be read! That book cover on the left is probably popping up all over your feeds, just as Breaking Dawn and Harry Potter and the Deathly Hallows did in the past. It is a book that a lot of YA readers have been looking forward to for a year, and like the two titles above, it brings to a close a series that many of us are attached to. Yep, you read that right: "us." When The Hunger Games first appeared on shelves, I stayed far, far away. You see, I have this habit of avoiding any book that gets far too much publicity. When I was reading non-classics, I preferred to search through the shelves myself and find things that others glanced over. That is not to say you won't find "popular" titles on my shelves, since you will, but I have always made a point of reading them because I wanted to. That distinction has always been important to me, even if somewhat stupid. Anyway, I didn't pick up The Hunger Games until last July. I had no idea it was a trilogy, otherwise I just would have waited until all 3 were out. But I read it, loved it, and was hooked. When Catching Fire came out, I read it, loved it, and continued to be hooked. Directly after reading Catching Fire, I launched my blog and my mission to read 250 classics. At the time, I had no intention of straying from my list, but as this day came forward, I realized I was going to cave in. So I decided, "what the hell" and determined to read it. I knew that there was no way for me to avoid any kind of spoiler in this kind of environment, and to be truthful, I wanted to share in the excitement.I have gone to midnight release parties for books, and I love the amount of drama and excitement that comes with the release of a long-waited for book. It makes me happy to see that people still crave books and literature in this form. It was with all that in mind that I re-read The Hunger Games on Sunday, and Catching Fire yesterday. I wanted it all fresh so that when I went this morning at 9 (when the bookstore opened) I could get my hands on a copy). This is the point you should stop reading if you haven't finished Mockingjay and don't want anything ruined. I was the first person in the store to buy a copy and I immediately came home to read. I had today off anyway, so it was a perfect opportunity to cuddle with the kitties and read. So I lay in bed for 3 and 1/2 hours and only put the book down once for a bathroom break. I will say from the beginning that I don't the book was what people were expecting. There has been so much focus placed on the romance of the characters that many forgot that the book was about the dystopian element. Yes, Katniss was certainly struggling with her feelings for the boys, but that wasn't the main theme or focus. It came secondary. Because of that, I think (I could be wrong), that Collins really tried to deliver more of that element to her readers. We were expecting a resolution to the triangle, and we got it. But I personally think the romance angle distracted from the power of the message she was conveying. The last 100 pages or so are truly powerful. They deliver a deep message the permeated the other two novels-about the rights and power of individuals versus the government that rules them. Katniss, and some of the other characters, believe that they know everything, even being in "power" as they were, but in the end they were simply pawns in a much larger game. The political leaders never filled them in on details unless they were necessary and hid many dark and dangerous secrets. That is what makes the scene of Snow's execution so wonderfully strong. Katniss reminded all of those watching that while a government can control many many things, they can never take away free will and the way a human can choose. She chose to execute the greater of two evils and in doing so, made it possible for something less corrupt to take over. It is inherent that most governments are corrupt, or at least that seems to be Collins' message. The end is where I think Collins may lose supporters, but I loved it. Katniss cracks up, as we see her losing it throughout books 2 and 3. The things she has had to endure come out in full force. There is no way a young girl of 17 can handle the amount of death and destruction she sees, so it makes sense that she will lose it. Of course Peeta can understand, so in the end, Peeta and Katniss make sense. They can heal each other and move on-as they both know what haunts the other. I knew all this from the moment Katniss and Gale are separated, when he apparently tells her to "shoot me" and she doesn't, and then where the roles are reversed. Gale and Katniss never bonded over a protection vow, and owe each other nothing like she does with Peeta. Had Peeta been in Gale's shoes, he would not have hesitated. He would do anything to protect Katniss from harm. That much is clear from everything we know about Peeta. We can't say the same for Gale, which is why is makes perfect sense that if there had to be a resolution to the triangle, that was it. In all I can say that I really did love the book. It was different than the other two, and I think there are portions in there that Collins felt needed to be there for her readers. My only gripe was the continuous discussion about the cameras and fashion-something that irked me in the other books as well. As a whole, I felt that the epilogue was the best part of the trilogy. It encompassed the fear that will forever haunt Katniss and Peeta, and all of those who lived through it. You could compare that fear to the tragedies in our own history, and the worry that we too will repeat the mistakes of the leaders before us. It is a book that I think holds far deeper meaning than what I pulled from it in one reading. And I am sure that in the coming days I will think of more to say about this closing volume and wish that I hadn't written this post right after closing the back cover. But I think that while it sinks in I will be glad to have these words to run back to. And when they open, the sun will rise. Here is the place where I love you," (389-390). Weekly Wrap-up for August 22, 2010: Book Slumps and Expectations. I have been in a bit of a slump. It has been taking me longer, and longer to get through some novels. I think a big part of that is I have been grabbing some bigger volumes. Also, I've been sticking to things outside my comfort zone, which makes slogging through them rather tiresome. This week, I really tried to make a conscious effort to just bite the bullet. And I did a most excellent job. The last two Sherlock Holmes novels were sitting on my nightstand for well over a month, just waiting to be read. I would eye them occasionally, but left them. On Wednesday afternoon, I decided to just get it over with and started in on His Last Bow, book 8 of 9. I ended up flying through the 8 shorts stores and immediately went into The Case-Book of Sherlock Holmes on Thursday. I finished it Thursday night in bed. Amazing? Yes. Although, when I finished, I felt rather sad. After all, Sherlock and Watson have become friends of mine in our 6 months together. I know that these stories will remain favorites on my shelves and that I will return to them again and again. But in good news, I FINALLY got to add The Complete Sherlock Holmes on my "Finished Books" List and it came in at number 55. Surprisingly enough, when I went to cross it off my whole list of 250 books, I found that it was also number 55. Strange? I thought so! I'm looking forward to talking about Sherlock and Watson in the near future! Since Friday night, I have been trying to get through the first 85 pages in my edition of Bleak House for Amanda's readalong. Sadly, I think I am still prejudiced against Dickens. But I am trying and I WILL make it through the whole book. My motivation for getting through those 85 pages (which I succeeded in last night) is that I am going to re-read The Hunger Games and Catching Fire just in time to pick up a copy of Mockingjay when it is released on Tuesday. I was originally going to wait to read it until I was done with this project, but I fear that it will be much like the Harry Potter craziness, and I don't want it to be spoiled for me. I read far too many book blogs to avoid spoilers. Anyway, I have high expectations for it, so I am excited to get my hands on the beautiful blue cover! In addition to those three Suzanne Collins titles, I think I might grab something by Henry James off the shelf (maybe Daisy Miller) or Salinger's The Catcher in the Rye, or Charlotte Bronte's Villete. The latter has been calling to me from the shelf, even though I have never read anything by Charlotte before. We shall see though! I have also been thinking about the read-alongs I have been hosting. I have had mixed success. I know that I am going to put them on hiatus, especially since I am participating in the Bleak House readalong, as well as one on Madame Bovary in October and one on Doctor Zhivago in November. Needless to say I will have my hands full of readalongs in the near future and I am not sure if I will continue to host any for the remainder of the year. Of course, I am always up for it, but I am not sure what options to offer. I am thinking about hosting War and Peace in the new year-perhaps through January and February. Would there be interest in that? Anyway, have a wonderful week! Look forward to the beginning posts about my blogoversary! This book is massive. I feel like I could actually knock myself out with it. It is a heavy brick that I have been lugging around, and it reads like a heavy brick in parts. I have completed the first, and shortest, part of 146 pages. Finishing that felt like reading a whole book. It almost made me cry when I realized that not only do I have two more parts to read, but I also have over 700 pages LEFT. Yes, this is massive. With that being said, I actually really like Dreiser's writing, and this interesting story. 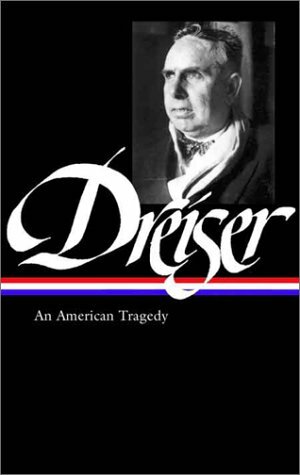 The novel is based on a real murder and Dreiser explores in this behemoth how a man could be driven to such murder. From how I am understanding it, the first part explores some of the main character's background (I'll touch on that more in a minute). The second part is on his relationship with the woman he ultimately murders (not a plot spoiler, promise. You know he's going to do it just from reading the back over). And the third part is the aftermath-the trial, etc. And I like that little play on words in the title. Instead of "dream," it is a tragedy, since Clyde doesn't seem to always get what he wants. In the first part where the novel explores his youth, we gain a lot of background information on him and his family. I don't exactly see how this is necessary in detail, but I can understand why Dreiser spends the time to paint a vivid picture of Clyde. Growing up, Clyde moved around a great deal as his parents were street-preachers and often worked in missions. At the time the novel begins, they have settled in Kansas City and Clyde really hates his life. He wants more than what his parents can offer him and dreams of something more. He ends up working at a soda fountain before being employed as a bellboy at a ritzy hotel. This is where the picture of Clyde really begins to develop. He lies to his parents about his wages so he can keep more for himself to buy nice clothes and go out with his friends. He makes up excuses to be with different girls and friends. He yearns for a life that is a lot grander than what he has and attempts to get there by any means possible. It is an interesting depiction of how the class system in the United States works. We all have that "American dream" of reaching far above and hoping to move up. And it is entirely possible for almost anyone to do so. But you have to wonder, as I did reading Clyde's story, is it actually worth it? Because, judging by the title, I don't think Clyde is going to get his dream. Anyway, this first comes to a shocking end as Clyde seems to be in the wrong place at the wrong time. I am curious to see how the massive middle section bridges this early portrait of a young man with lofty goals into a murderer. I have a great fondness for Walt Whitman. As a high schooler, I didn't understand him. It took a college professor to help me understand him. What resulted was a paper on his epic "Song of Myself" that garnered me the highest grade in the class by .5. That 4.0 paper was one of the highlights of my English career and I owe a great part of it to Whitman. I love the way he uses language and transforms it. He takes seemingly everyday emotions and scenes and transforms them into something far more meaningful. I love that, and I love everything by him. I recently pulled out my copy of Leaves of Grass to leave by my bed. It has been a comfort to me in the past and I have needed that same level of comfort and familiarity lately. The poem I am posting here is called "Assurances." I first read it back in college, and it is a poem I return to often. It reminds me that things will ultimately be okay in the end, and that while I may not be happy in this moment, things will return to normal eventually. This poem comforted me when my grandmother was in the hospital back in 2007 shortly before she passed away. It eased some of the pain I felt then, just as it eases me now. For those of you who aren't poetry lovers, I hope this appeals to you. This book intimidates me. I mean, it is a massive brick of a book with super small print. It scares me because of its sheer size and weight. Besides, it is by an author I have no experience with. So yes, I might have a reason to be frightened. However, the premise of the novel intrigues me and even before I embarked on my challenge, this book was on my TBR list. I owe that to a young adult novel, A Northern Light by Jennifer Donnelly, that I read last year. In the YA novel, the crime committed in An American Tragedy comes into play. Since reading that Donnelly was inspired by Dreiser's work, I knew that I eventually wanted to read this massive brick of a book (and I fully recommend Donnelly's novel as well). I know that the "Crime" in the crime in the story is about a murder, but if this was just a story about a single murder, I know the author could have shortened it from the 859 pages of tiny text. I am looking forward to how this develops and plays out. And if it can keep me entertained for as long as it will take for me to read it! I will also be reading Sister Carrie in the future, provided that Dreiser doesn't make me pull all of my hair out. I think William Shakespeare is one of those writers people are most intimidated by. First, he's a poet and a playwright-two things that a majority of modern readers have no exposure to. When we expose ourselves to a play we are usually in the audience, not reading the script. Second, a lot of language in Shakespeare's plays consists of words that were made up, and words we just don't use anymore. The meaning and interpretations of these words are complicated and complex. We certainly don't speak that way now, and to be frank, many people back in Shakespeare's time didn't speak that way either. So, there seems to be this huge stigma against William Shakespeare and his plays. I think they are often seen as very elitist and intelligent. Personally, I find them slightly challenging...and fun. Here's something you might not know...Shakespeare is a very funny man, and his comedies/romances really display that sense of humor. I'm not saying you won't have to struggle through Shakespeare. I still get intimidated going into his work. In fact, "The Tempest" is the first play by Shakespeare that I am tackling solo. The other Shakespearean plays I have read so far have all been re-reads of those I read in high school and college. But, surprisingly, I am faring rather well for being so scared. I will say that it is nearly impossible to read straight Shakespeare. I have one of those big, bulky hardcover collections of his complete works, and I cannot read from it and understand it (maybe one day I will). I have been alternating my reading of his work from two different editions: the Folger's line of Shakespeare, as well as Barnes and Noble's versions. Both offer the direct Shakespearean text on one side, with translations and side notes on the other. It makes reading MUCH easier. I also really like No Fear Shakespeare. It is great for beginners as it gives a direct modern-day translation of the page for easier comprehension. 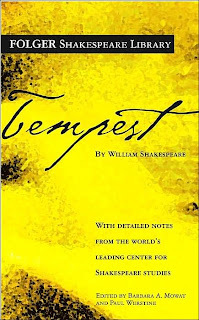 Anyway, moving on to "The Tempest" I have to say that this is a far more interesting play than I was anticipating. I haven't read it before, or seen it performed, so I am learning the story as I go. Prospero and his daughter Miranda were deserted on an island after Prospero was kicked out as the Duke of Milan. They were left with Prospero's books, which hold all of his knowledge (he can use magic). One night/day a ship is wrecked near the island and we discover that Alonso, the King of Naples, is on board. Alonso was responsible for Prospero's exile, and seemingly, Prospero brought the tempest that shipwrecked the ship. It seems as if Prospero is going to get his revenge. In the first two acts we meet some of the other men on board with Alonso, as well as the other inhabitants of the island. There is Caliban, who is a slave to Prospero and Miranda. We also meet Ariel and some of the other spirits. Prospero saved Ariel from his fate being stuck in a tree a few years earlier and has yet to set him free. Ariel intrigues me. I perhaps owe this to a young adult novel I read last year, Eyes Like Stars by Lisa Mantchev, that displayed Ariel and his trickery. At the time, never having read "The Tempest" I didn't know Ariel's backstory. I like that I am learning more about a character I know from another novel. I am also finding this play much easier to read than, perhaps, "Macbeth." It was one of Shakespeare's last plays, and perhaps he just got better with age. In any case, I love the writing and wit. And I am certainly looking forward to how Prospero gets his revenge...and what will become of Ariel. That my remembrance warrants," (I.ii.44-46). I prize above my dukedom," (I.ii. 165-168). Ariel and all his quality," (I.ii. 189-193). If you participated and completed a post, please comment and leave a link so I can add your name below! Weekly Wrap-up for August 15, 2010: New Bookshelves and Organization! It has been quite a wonderful week! Months ago I made plans with my friend Kyla to go to Michigan's sole IKEA store. When we had made plans originally, it was so she could buy some things for her new apartment-I was just going to tag along. However, when my birthday came around last month, Matt didn't know what to get me. I was kind of at a loss, since I didn't know what I really wanted...until I realized that the perfect gift would be a new bookcase to match my existing one that we bought back in January (it is from the "Billy" line). When I lived at home, I did not have bookshelves in my room. Instead, my mom let me use the linen closet outside my bedroom. That closet was STUFFED with books. Books we stacked in every which way and went back three layers, and sometimes four! It eventually got too full so I started putting my books in my brother's old closet (he had moved out by then) to help with the weight in the other closet. It was madness. Moving into the apartment was difficult at first. All my books (in 26 different boxes) have been sitting in a closet in our second bedroom. When we went to IKEA back in January, it was to get shelves for our DVD collection (also pretty big-probably 500+ movies) and to get me one shelf to store my classics. Since then, I have wanted another shelf. All of my classics barely fit in the case I have (It is 32 inches wide and 80 inches tall, with 8 shelves-I bought two extra to fit more). So, I wandered into IKEA on Thursday with Kyla with the mission of bringing home another bookshelf along with some other fun items. Well....I got to the bookshelf area and saw that in addition to what I wanted, they had another that was narrower-only 15 or so inches. And I thought to myself, "Gee, Allie, it would be swell to put that smaller one in the corner on an angle." I called Matt and he said yes, so not only did I come home with one more BIG bookcase, but I also grabbed the skinner one, and two more shelves for my new big case. They fit in our bedroom, which is now way too cluttered with furniture (but who cares if my books are there!). I tackled opening the closet to bring books to my new shelves, but got overwhelmed pretty quickly. I made sure to pull out some of my favorites, but it was hard to decide which books to put back in their boxes. I ended up giving up after pulling 13 or 14 boxes from the closet and picking my favorites from there, but I know there are some old friends who are still packed away. Anyway, I was wondering how everyone else organizes their bookcases? One of my larger cases has all of my classics, which is pretty much everything I am reading for my challenge and then some. I used the smaller bookcase to place some of my hardcovers on since the shelves are taller (I didn't buy extra shelves for it), and the new case has a lot of YA, Science Fiction, Fantasy, and a few contemporary lit things on it, all alphabetized. I'm not sure if I like it the way it is. I love having a case devoted to my classics, but I obviously don't have the room to have a shelf for science-fiction, one for fantasy, etc. But how do you all organize your books? I would love to know! In reading news, I finished The Last of the Mohicans by James Fenimore Cooper. I absolutely hated the first Cooper novel I read back in college, but I really enjoyed this one. I'm looking forward to when my posts go up! 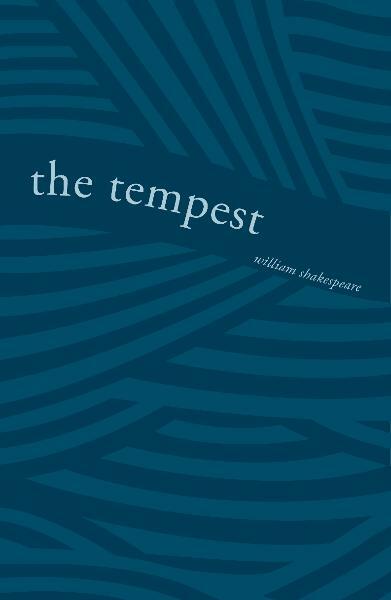 I also read the first two acts of The Tempest in anticipation for the read-along tomorrow. It is the first new Shakespeare play I am reading for my challenge, but it is not as rough-going as I thought it was going to be. Tonight I am going to try to knock out the first 80 pages of Charles Dicken's Bleak House for Amanda's ReadAlong, but we'll see how that goes. Does anyone have any suggestions for the next big novel I read? I'm not sure what I want to dive into! I got into a conversation with my husband tonight that got me thinking about our differences. Matt is not a big reader. While he enjoys a few things, namely books about mountain climbing, adventures gone awry, and certain biographies, he is not a bookish person like I am. Every once in awhile he'll pick up a book and read in bed with me, but that it maybe, MAYBE once a month. He just doesn't see the merit in constantly reading. On the other hand, I have always been a huge reader. Ever since I could read I can remember lugging books with me on vacations and to doctors' offices and to ballet classes. Books were a great escape for me as a child, and as a teenager. I have no problem turning the TV off and spending hours before bed reading my book, or looking at book blogs, or researching new titles. It is something that really comforts me. We never really have problems because of these differences. I enjoy reading my books at night, and he spends time playing XBOX, or watching TV. We simply find value in different things, and having different interests is good for us. Anyway, Matt came home from work tonight and was helping me finish putting books on my new bookshelves (more on that Sunday). I had already dragged some boxes out of the closet that stores my books and I was trying to decide which titles I was going to display, since there was no way all of my books could be out (that is a dream for another day). He was rolling his eyes out as I rejected some titles, but grasped some and held them close. He asked about some, so I told them what they were about, and so on. It was a funny conversation and made me think a lot on how those hundreds of titles have shaped me. To Matt, many of those books are JUST books, nothing more. He can look at the image on the cover, or the author's name and feel nothing. I, on the other hand, look at a novel on my shelf and I can remember where I was when I read it. I can feel the pages in my hands, remember the characters, and remember who I was when I held it. Each of those books doesn't just contain the story the author wrote-they also contain a small part of me. So when Matt suggested I get rid of some-namely the ones I was placing back in boxes-a small part of me was hurt. While they were not big enough or important enough to go on the shelf, they are still a large part of who I am. And getting rid of them would be painful. Perhaps I have too much of an emotional connection to my books. But their covers and worn pages bring back a lot of memories, and define me. I can't wait until I can help my children discover them in the future; pass them on so they can have their own stories and memories for the future. Anyway, I was curious, how do you all feel about your books and your reading habits? 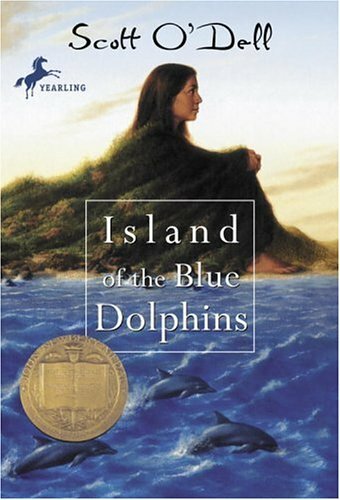 Thursday Treat #24: Island of the Blue Dolphins by Scott O'Dell. When I was 8 or 9, one of my older brothers came home from school with this book in hand. They were reading it in class and he was bored and hated it. I was curious about it, so I grabbed it and stole upstairs to read. I only got a few chapters in before he took it back, but he promised to bring it back for me. Eventually my mom bought me my own copy, which I finished quickly. What I found in Island of the Blue Dolphins by Scott O'Dell was a story of survival and courage. At this same stage in my life I was discovering the wonders of Laura Ingalls Wilder and The Little House on the Prairie. Much like Wilder, O'Dell captured a small portion of history and survival in a way that made it so appealing to me as the reader. I truly believe that O'Dell and Wilder showed me how history was the story of the people who lived in it, not the facts. I have them to blame for that degree I have from MSU. And it was a story like this-of a girl left alone on an island for years-that truly captured my imagination. Forgotten by her people in the middle of a storm, Karana is left alone for years on an island. Instead of being able to rely on those around her, she is the one who must hunt and gather. She must make her own weapons to survive. And survive she does. It was a story I read over and over again. My copy of this book is battered and torn in two, but I still love every page of it. I ended up getting every Scott O'Dell book I could and reading them, and while a few more were wonderful and enthralling as well, Island of the Blue Dolphins remained my favorite. This book is probably the reason I loved Robinson Crusoe so much, as well as countless other tales of survival and loneliness. It was the first of the genre I had read and for that, I remember it and cherish it. In my earlier post on Wharton's The Glimpses of the Moon, I talked about how I really do love and admire Wharton's writing. She always manages to capture my heart in a way that many other writers can't. And while this is certainly not my favorite Wharton (again, that honor goes to The House of Mirth), I enjoyed this novel on its second reading far more than I did on the first. I think a large part of why I enjoyed it so much more is that I have gained a little life perspective since my first reading a couple of years ago. In the novel, Nick and Susy are on the fringes of society. Both of them do not come from money, but have wealthy friends who aid them along. Both Nick and Susy benefit from these friends. Susy is given old dresses from a season or two prior, and gets to go along on trips and excursions without paying anything. Nick attends dinners and trips with men. Their paths cross again and again before they come to a decision to marry. Their marriage will bring them both benefits. As a pair, they will be invited to the "couples" events. Their two-year honeymoon can be spent traveling from vacation home to vacation home of their friends and reaping the benefits. This is how the novel begins. It is clear from the beginning that Nick and Susy are meant for each other. They understand one another and care for each other, but make a pact that if anything better comes along, they will let the other go. Obviously, fate intervenes in their happiness and they part for a time. Where do I fit into all of this? Since the first time I have read it, I have gotten married. And while Matt and I were dating and together for 7 1/2 years before we were married, since being with him and living with him, I have learned far more about him and his personality. And where we are not in a position like Nick and Susy, I can understand the trials and missteps that you can take in your first months and year of marriage. That is where the similarities end, but I can understand the anger and frustration of Nick, Susy, and their lack of fortune. Don't we all wish we had just a little more to be comfortable? I suppose the main reason I fell a little more in love with this novel is the whole idea that sometimes what you believe you want is not what you need, or what is best for you. At a certain point, Nick and Susy break apart (not really a spoiler, I promise). Both of them want "something" to be "better" and "accepted." But is that really what is needed? I am at a point in my own life where I am approaching the third year after I have graduated with my teaching certificate, and still no job. At this point in my life I have to tell myself, "I want a teaching job, but is it really what I am meant to do?" Wharton's work simply reiterated that and helped me see (even further than what I have), that perhaps I am not "supposed" to be teaching and that the answer may already be in front of me. It seems a rather deep interpretation of a novel based on society and Wharton's personal dislike for that kind of monetary status, but it is what I pulled from these wonderful 250 pages of Wharton awesomeness. "The idea that he might be in the same place with her at that very moment, and without her knowing it, was so strange and painful that she felt a violent revolt of all her strong and joy-loving youth. Why should she go on suffering so unbearably, so abjectly, so miserably? If only she could see him, hear his voice, even hear him say again such cruel and humiliating words as he had spoken on that dreadful day in Venice when that would be better than this blankness, this utter and final exclusion from his life! He had been cruel to her, unimaginably cruel: hard, arrogant, unjust; and had been so, perhaps, deliberately, because he already wanted to be free. But she was ready to face even that possibility, to humble herself still farther than he had humbled her--she was ready to do anything, if only she might see him once again," (224). Anyone who has been following and reading for awhile knows that Wharton is one of my all time favorite writers. I was forced into reading her work back in high school and she became a close friend in my college years. Her writing soothes me and there is such a variety that I can always find something to sink my teeth into. Her novels are by far her strength. While I enjoy her short stories, I am more of a novel person anyway. She creates realistic and tortuous situations for her characters and develops them in a way that is so incredibly enthralling. Anyway, The Glimpses of the Moon is a novel I have read once before, so it should be like visiting an old friend. The story is a little more light-hearted than some of her other works. Nick and Susy Lansing marry after realizing that together they can improve their social standing. Both of them travel with the rich and beg some favors, but together, they can advance more. But, they both agree that if something better should come along for either one of them, the other will let them go. Interesting premise, right? I will say, from my previous reads, that this is not one of my favorite Wharton pieces. I prefer her gloomier stuff, but this is every bit as fun and juicy as say...The Custom of the Country. I will also be reading the following as part of this challenge: The Age of Innocence and The House of Mirth. I already read and finished Ethan Frome and if you click on that link, it'll take you to my favorite post about that book.